A shout. “Hold it!” The camera cuts between stunned faces as everyone waits, sweating, wondering what sort of interjection will shake things up next. This happens so often, you’d think they would be used to it by now. But no. Shock. Disbelief. Someone barges into the courtroom—someone new, someone unexpected. Maybe someone shouts a new piece of information from the witness bench. Maybe something isn’t what it seemed to be, or someone wasn’t who she seemed to be, and maybe everything you thought you knew about this trial is about to be flipped on its head. Phoenix Wright: Ace Attorney - Dual Destinies, the clumsily-titled fifth main installment in the Phoenix Wright series, is full of surprises like this. It’s a chaotic blur of perjury and plot twists, a journey through a world where the outcome of murder trials is determined not by nonsense like “law” but by an attorney’s ability to pull out the right evidence at the right time. When you get there, you’ll know what he means. At this point you might be wondering: just what is a Phoenix Wright game? A Phoenix Wright game is a lawyer simulator, and it’s also a narrative adventure, and it’s also a visual novel. You, as the eponymous defense attorney and his band of peppy subordinates, are charged with defending a wide range of clients from false murder charges. To do so, you have to call witnesses and poke holes in their testimonies, picking apart their lies using logic and evidence that, in Dual Destinies, is rarely a challenging activity, but is always an entertaining one. This is all far less dry than it sounds, because Phoenix Wright’s judicial system is a surreal world where witnesses are all compulsive liars and verdicts are administered single-handedly by a confused old judge. Dual Destinies is a funny game, and a quirky one, and like its predecessors, it is excellent at convincing you to buy into its world. It’s good at getting you to care. It’s also, I think, the perfect starting point for series newcomers, because the story is self-contained and the emotional impact doesn’t rely upon your knowledge of previous games. There are returning characters, yes, but the game does a good job of explaining who they are and why they matter. As the fifth mainline Phoenix Wright game and the first for the 3DS, Dual Destinies is faced with the paradoxical question that every longrunning video game series must answer: how do you move forward while simultaneously embracing the formula that has worked so well for you in the past? Dual Destinies straddles that line well, and the folks at Capcom have added tons of little tweaks that make the Phoenix Wright formula exponentially smoother. In past games, for example, text scrolling was annoyingly slow, and you could only speed through dialogue once you’d already beaten the game (or seen that dialogue before); in Dual Destinies, you can zip right through from the start. The investigation process is also somewhat different—crime scenes are now 3D, and you can look at them from multiple directions. The game will also let you know what parts of the scene you’ve already examined, so you don’t have to hunt for pixels or inadvertently check the same piece of evidence 10 times in an attempt to find something new. Everything is more streamlined and more convenient. I actually reached out to Capcom about this bug, but they said the developers hadn't seen it before, and they weren't able to re-create it. I asked a couple of other reviewers, and they hadn't seen it either. When I rebooted my game, it went away. So if you do happen to run into this glitch, just turn the game on and off and you should be okay. 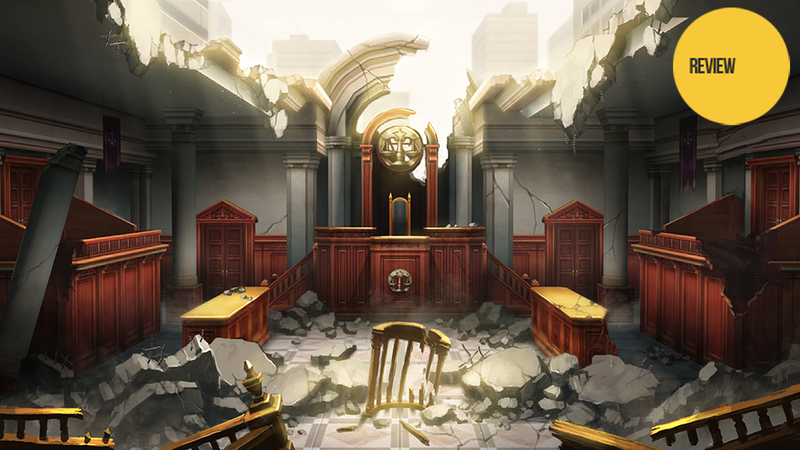 There are five cases in Dual Destinies, although the fourth and fifth are really just one long one split in half. All of these cases tie together, and they’re all satisfying in different ways—the first couple of trials, for example, are less about figuring out who committed grisly murder and more about contextualizing the events at hand: what happened? Why did it happen? How did it happen? Some of the murder schemes turn out to be ridiculously convoluted, but that's just part of the fun. As you might expect from a Phoenix Wright game, many of the new characters are fascinating—the law professor who believes that ends always justify means; the kleptomaniac butler; the quirky detective with a love for all things justice. Other characters are boring and stale—the feeble Juniper Woods, for example, who makes appearances in not just one but three different cases, is generic and timid, and part of me wanted to see her declared guilty just so she'd go away. But the good outnumbers the bad. The three heroes—Phoenix, his apprentice Apollo Justice, and newcomer Athena Cykes—make a particularly strong impression, and their progression throughout the game is both meaningful and satisfying. You'll swap between all three for different parts of each case, and you'll get a peek at their inner thoughts along the way. As you interrogate and cross-examine and press the witnesses and defendants of Dual Destinies, it's tough to not get a kick out of their ridiculous animations, and their insane motivations, and their quirky habits. The dialogue has been localized quite well—it's punchy and entertaining, even if it does have that annoying Phoenix Wrighty tendency to overexplain and hold your hand through every puzzle. That's not why you play a game like Dual Destinies, though. This isn't a game meant to strain your logical skills or exercise your brain muscles. Challenge isn't really the point.